What is 'cedar nuts'? I did not think cedar trees produced any nut at all. The tree bearing the nuts sold at www.ringingcedarsusa.com is called Siberian cedar (or also Siberian pine, Pinus sibirica). It is different from the trees which are called 'cedars' in the U.S. (or, for that matter, from the cedars of Lebanon). Because in Siberia Pinus sibirica tree is only called Siberian cedar (and elsewhere it is often called Siberian pine or Siberian stone pine) - we use the terms 'cedar nuts' and 'pine nuts' interchangeably. We also call our pine nuts 'Siberian cedar (pine) nuts' to distinguish them from other varieties of pine nuts (e.g., Korean or 'Chinese' pine nuts, American pinyon pine nuts, Italian pignolia, etc.). See more about the magnificent and sacred Siberian cedar tree. Are the cedar pendants made from an actual "Ringing Cedar" or are they from a cedar that was not "Ringing"? Thanks, Rick. The pendant made from Siberian Cedar which is older than 300 years, it chosen by one of Siberian elders who have knowledge about healing powers of trees. These Siberian Cedars have positive power, and people who wear one notice an increase in their mental and physical health. Anastasia found a way to give out the power of a Ringing Cedar to every one who needs it, this is why Vladimir Megre didn't cut the Ringing Cedar (read the book #1 "Anastasia" chapter #18 "In him was life; and the life was the light of men"). How do I store pine nuts? How long do they keep? Store your pine nuts in a refrigerator. They keep for 6 months from the date they were shelled and vacuum packaged. You can also freeze them to prolong their shelf life indefinitely. Can I freeze pine nuts to prolong their shelf life? Yes you can. Their moisture content is relatively low, so freezing does not degrade the texture, taste or nutritional and medicinal values of the nuts. In fact, this is a quite natural way to preserve pine nut freshness - during harsh Siberian winters pine nuts do freeze. Frozen pine nuts keep well indefinitely long. Should I roast pine nuts before eating? You could roast Siberian pine nuts (on a pan or in an oven at 325 degrees F), but they are best enjoyed raw - this is how they preserve the most of their nutritional and medicinal values. If you previously tasted raw pine nuts and did not like them raw, chances are that you tried the American pinyon pine nuts (this is a different variety of pine nuts which does become tastier if roasted). Our pine nuts are sold ready to eat. However, they can definitely be roasted, or even roasted and salted to your taste. Are your pine nuts (cedar nuts) the same as the 'Chinese pine nuts' sold in health food and grocery stores? NO. There is a huge difference. First comes freshness. The 'Chinese pine nuts' sold in grocery stores are never really fresh: they spend weeks traveling by railroad in China (in questionable sanitary conditions), then at least two months crossing the Pacific on a ship, and months more in the U.S. before they get onto grocery store shelves. In transit, they are not refrigerated for extended periods of time, which brings quality down and necessitates treatment with chemicals to keep the nuts from going rancid. In comparison, our pine nuts bearing "The Ringing Cedars of Russia" brand are quickly processed, chemicals-free, and shipped directly from Siberia by air to North America, and are refrigerated in clean, sanitary conditions. Second comes fairness and concern for Nature and human rights. The 'Chinese pine nuts' or the ones sold in grocery stores are for the most part pine nuts harvested in Russia, then smuggled through the Russian-Chinese border, processed in China using slave and child labor and then shipped to the U.S. (90% of pine nuts imported into this country come this way - for details please see article by Sharashkin and Gold). In contrast, our pine nuts are fair trade: harvested in Siberia by local communities, purchased through small-scale local buyers, locally processed and shipped directly from Siberia to North America by air. Finally, the 'Chinese pine nuts' are usually a blend of Siberian pine nuts and Korean pine nuts, the latter being of lower nutritional and medicinal value. In contrast, our pine nuts are 100% pure Siberian pine nuts (from Siberian cedar trees, Pinus sibirica). How do I store pine nut oil (cedar nut oil)? How long does it last before it goes rancid? Store your pine nut oil in a refrigerator. Two most important factors to prevent it from going rancid are: 1) store it at a low temperature and 2) keep it away from light. If refrigerated, our pine nut oil has a safe shelf life of 12 months, but - given the exceptional purity of "The Ringing Cedars of Russia" pine nut oil - it may stay fresh even longer. How is your pine nut oil bearing "The Ringing Cedars of Russia" brand different from other pine nut oils sold at some gourmet food web-sites? There are several major distinctions. 1) The cedar nut oil bearing "The Ringing Cedars of Russia" brand comes exclusively from wild-harvested Siberian cedar nuts (Siberian pine nuts) - the most nutritious and medicinally valuable pine nuts in the world. In comparison, other pine nut oils are usually pressed from the Italian pignolia pine nuts, which are not nearly as potent and are often harvested from trees growing in plantations. 2) Our pine nut oil is extra virgin (100% cold pressed from freshly shelled raw pine nuts), whereas most pine nut oils on the market are either not cold pressed or even pressed from roasted (!) pine nuts, which significantly decreases the oil value. 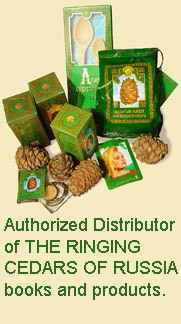 3) Finally, "The Ringing Cedars of Russia" pine nut oil is the only pine nut oil available on the market anywhere in the world pressed with wooden presses in accordance with traditional techniques described in Vladimir Megre's life-changing book "The Ringing Cedars of Russia" (available from our on-line Store). In contrast, all other pine nut oils are pressed using steel presses, which immediately degrades them (contact with steel oxidizes some of the pine nut oil's most important ingredients such as vitamins, and is known to remove the 'life force' from the oil).